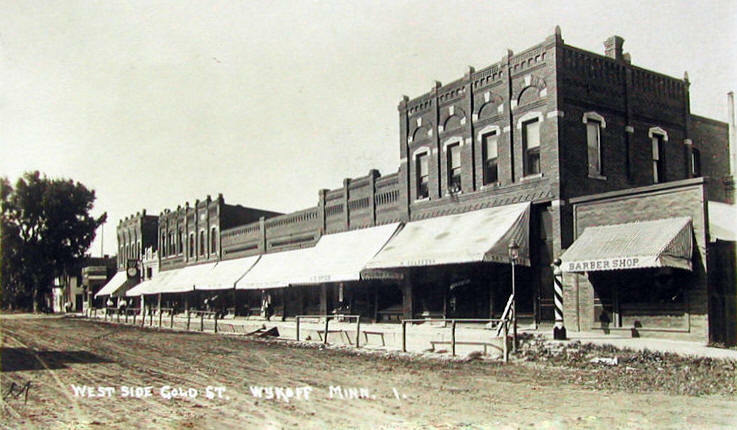 Do you have photos, historical accounts or other items pertaining to the Wykoff area? Would you like to share this historical information with the world? LakesnWoods.com would like to publish your Wykoff photos (current or historical) or historical accounts on this website. Original materials can be returned and your privacy will be respected. 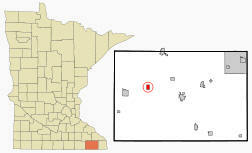 Wykoff is a city in Fillmore County, Minnesota. 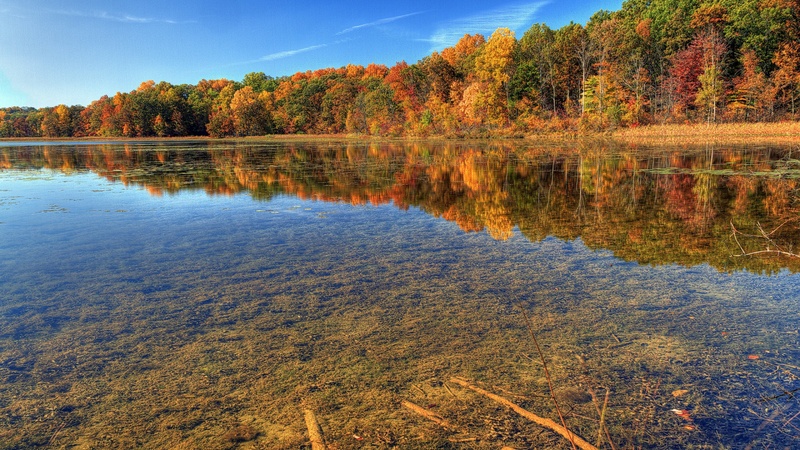 According to the United States Census Bureau, the city has a total area of 0.96 square miles (2.49 km²), all of it land. 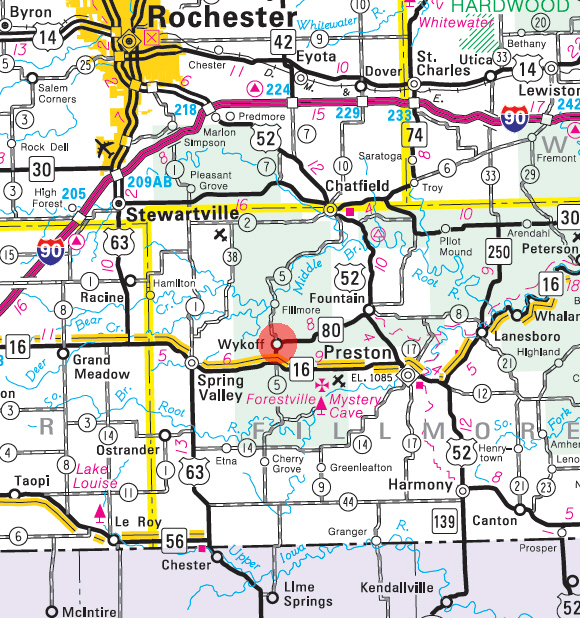 State Highway 80 and Fillmore County Road 5 are major arterials. The elevation is 1,322 feet (403 meters). As of the census of 2010, there were 444 people, 198 households, and 126 families residing in the city. The population density was 462.5 inhabitants per square mile (178.6/km2). There were 217 housing units at an average density of 226.0 per square mile (87.3/km2). The racial makeup of the city was 98.9% White, 0.2% African American, 0.2% Native American, 0.2% Asian, and 0.5% from two or more races. There were 198 households of which 24.7% had children under the age of 18 living with them, 48.5% were married couples living together, 8.6% had a female householder with no husband present, 6.6% had a male householder with no wife present, and 36.4% were non-families. 27.8% of all households were made up of individuals and 11.1% had someone living alone who was 65 years of age or older. The average household size was 2.24 and the average family size was 2.75. The median age in the city was 44 years. 21.4% of residents were under the age of 18; 7.1% were between the ages of 18 and 24; 22.5% were from 25 to 44; 28.7% were from 45 to 64; and 20.5% were 65 years of age or older. The gender makeup of the city was 48.2% male and 51.8% female. 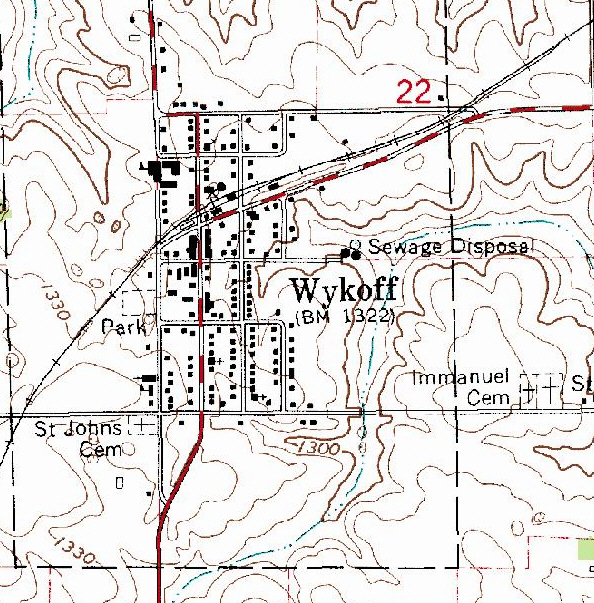 WYKOFF, a city in Fillmore Township, sections 21, 22, 27, and 28, platted in 1871 and incorporated March 8, 1876, commemorates Cyrus G. Wykoff of La Crosse, Wis., who was the surveyor for construction of this railway and was one of the proprietors of this townsite. Its post office began in 1858 as Free Soil Prairie, changing to Wykoff in 1871. Wykoff Fest is on and ready for fun! It all starts Saturday with a Pumpkin Bake-off, Treasure Hunt and a Kiddie Pirate Parade! That is just some of the amazing events going on Saturday morning! 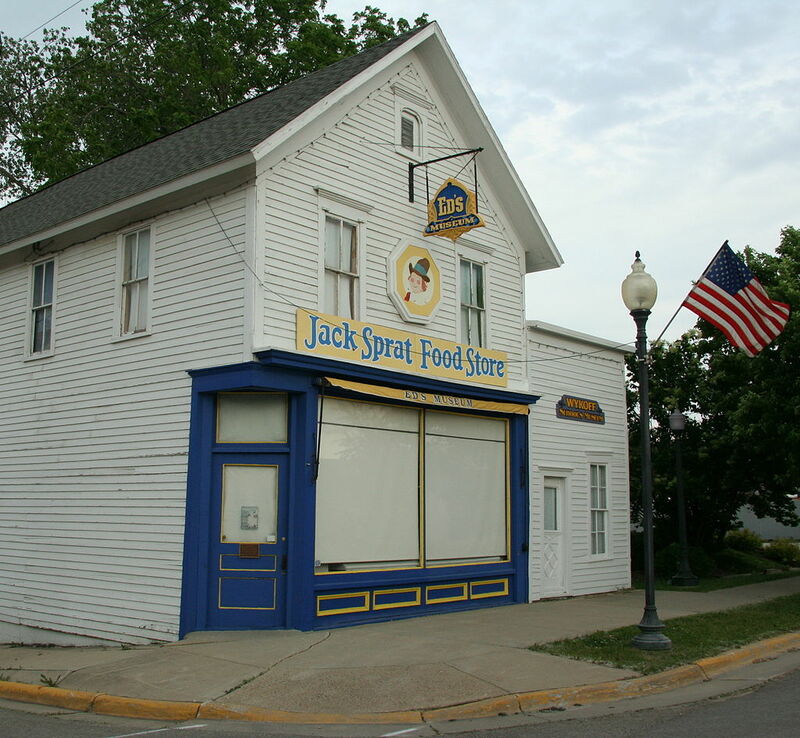 Don't forget the Parade from 11am - Noon, music from New Blue Denim Farmers and Casey and the Good Times from 12-2 and 2-4! The fun continues in the afternoon with the Bouncy House at the city playground from Noon - 2pm, Ice Cream Social from 12-3 at the Fire hall and Bingo at the City Hall Meeting Room from 12:30-1:30pm! The Dance starts at 7:30 and goes till 11:30 with Greg hall & The Wrecking Ball! Sunday has Breakfast at the Community Center, the tractor pull starting at 12:30pm, the Chili Feed at the community center from 3-7pm and the raffle drawing at 7! 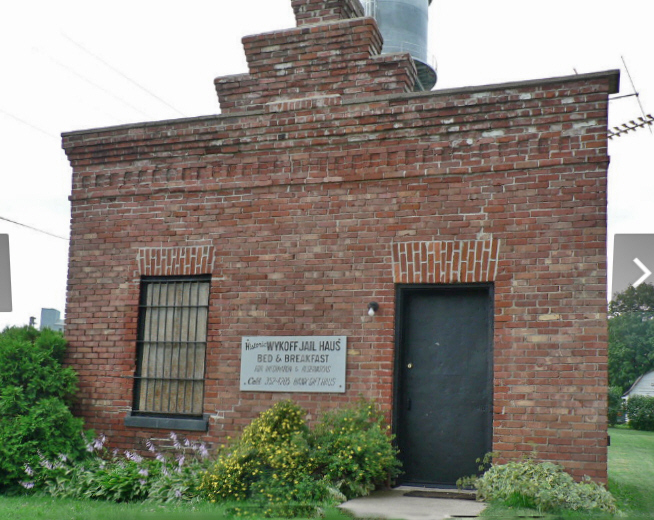 1913 City Jail restored to an attractive & comfortable Bed and Breakfast. Unique, cozy, private accommodations for a couple or the family .......You will surely enjoy your night in jail! Breakfast coupon can be used at the local diner, the Gateway Inn. 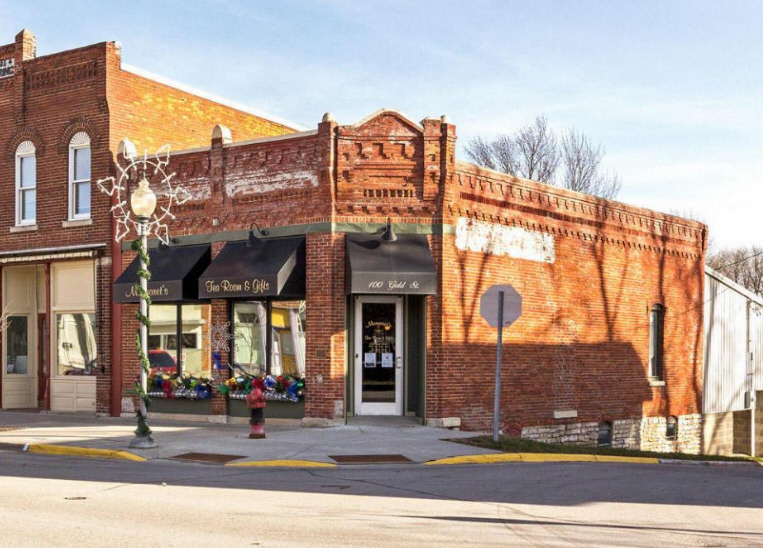 And while you're in town ask (at the Bank Gift Haus) about a tour of Ed's Museum. We are a full service body shop owned and operated by John and Cory Bremseth. Specializing in the restoration of classic automobiles, we've been handcrafting beautiful cars since 1991. John and Cory have decades experience restoring and repairing a wide range of classic vehicles; foreign and domestic. 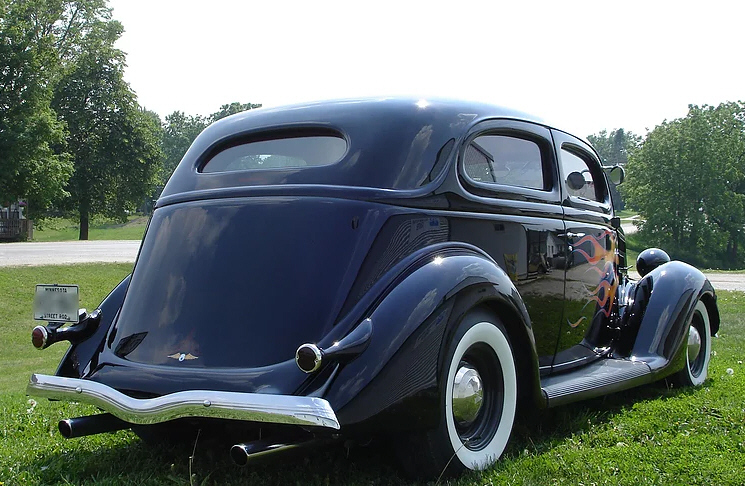 The list of vintage American muscle cars restored by Bremseth Body Shop is endless with examples such as Ford Shelby Mustangs, Dodge Vipers, Chevrolet Chevelles, Mercury Cougar Eliminators, Chevrolet Corvettes and many more. Our cooperative is one of many company-owned, locally governed service centers that are part of CHS Inc., a highly respected and financially stable Fortune 100 company committed to delivering value. 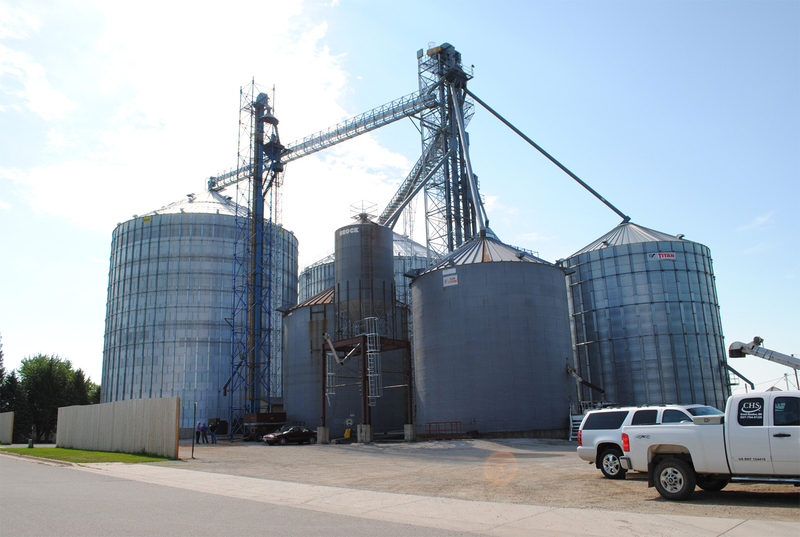 Our member-owners and customers are connected from locations close to home in southeast Minnesota and northeast Iowa to essential global markets. 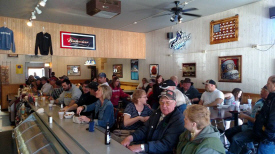 Denny's Trailer Sales is a family owned and operated business established in 1986, and located 3.5 miles north of Wykoff, Minnesota, by the village of Fillmore. We take pride in our customer service and satisfaction in this low pressure atmosphere. We have a large selection of trailers as well as a full service repair facility with over 20 years experience. We have a large selection of horse and stock trailers, new and used. DreamAcres is an off-the-grid, organic farmstead that offers educational and cultural programs, and grows and produces darn good food. 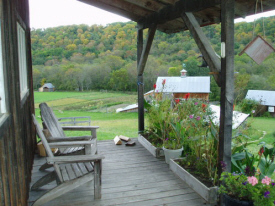 The farm is home of the Dreamery Rural Arts Initiative, a nonprofit which puts on Flourish Summer Camp, True Leaf and Thunderground Retreats along with many other events and performances throughout the summer months. In addition, the farm hosts school and family retreats, and facilitates custom-planned workshops in appropriate and alternative technologies. 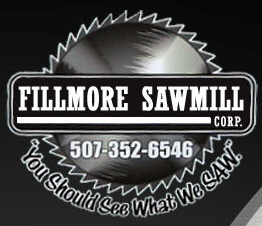 Fillmore Sawmill, Corp. is here to serve you for "sawn to suit" lumber orders, custom processing of your logs, blanks for rustic signs, firewood, used sawmill/ forestry equipment, sawmill consulting & training. Please take a look around at our Current Inventory and Services. 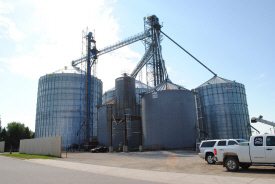 We are dedicated to the goal of providing our customers with quality equipment, expert service and competitive prices." We look forward to helping you find what you are looking for. 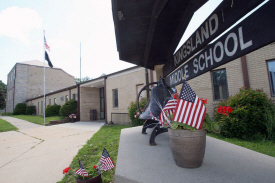 Why Homestead? Customized Protection With over 30 A rated companies compared, you’ll get an insurance package tailored to your needs. Local Expertise Having grown up on a farm, Steve knows it’s more than a job – it’s who you are. Small-Town Service Friendly, personal, and just down the road. Or if you prefer, we can come to you. Since being established in 1956, Pete's Auction & Photo has been providing Internationally recognized Photography and Auctioneering Services. Some of our livestock photographs have graced the covers of Holstein World and other prominent publications. 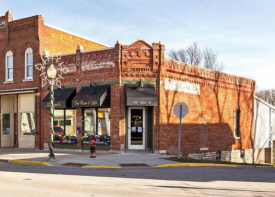 The Wykoff branch of Security State Bank was originally chartered on February 1, 1905 as the First State Bank of Wykoff. There were two banks in town at that time. The other bank was Exchange State Bank and it did not survive the Depression.The current Bank building is the original building. 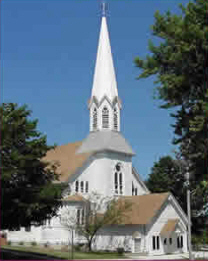 Two additions have been added to the building, the latest was completed in 1980. We buy good used trucks and trucks for parts everyday. Call or e-mail for a quote on your excess equipment. We run a huge salvage operation and sell parts by the trailer load or the trunk load. Although we welcome new customers everyday. We treat our customers like our parts. We would rather recycle them to be worked with again than assume a new one would be better. We like to think that doing business is a 2 way street everytime and do our best to accommodate the needs of every customer. Just like we want to see you again, because we do!